Currently sleeping between a rock and a hard place? Well, it’s a good thing you stumbled upon Bambi and their fantastic range of bedding. Founded in New South Wales over thirty years ago, Bambi has long since helped Australian families sleep well under our southern skies. When it comes to high quality bedding, it’s pretty hard to match them. The Bambi King Cooltouch Active Mattress Protector is great for helping guarantee you a good night’s sleep. 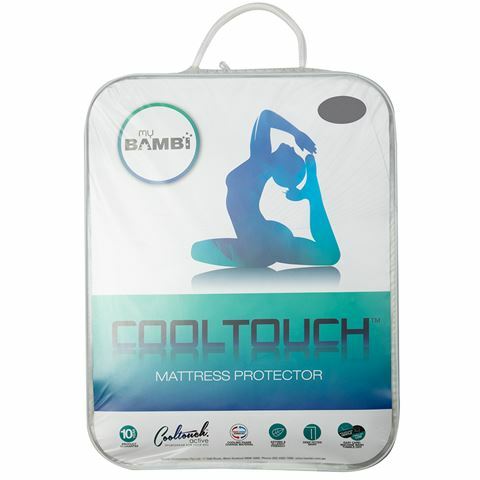 This Cooltouch mattress protector is designed to help stop you from getting too hot at night, featuring an upper layer of cooling phase change material. It’s also asthma and allergy friendly and, as you’d expect, super comfy. Grab this mattress protector and make sure that every night’s sleep is a good night’s sleep. Features an upper layer of cooling phase change material.